Girls @ The Tech Luncheon is part of a year-round program focused on building a pipeline of opportunities for young women. May 16, 2018 Menlo Park, CA — Hundreds of community and technology leaders gathered today with middle and high school students for a conversation about diversifying leadership in Silicon Valley and how best to inspire more young women to pursue careers in science, technology, engineering and math at the annual Girls @ The Tech Luncheon, presented by The Tech Museum of Innovation. The luncheon, held at the Sharon Heights Golf & Country Club, featured a conversation with Carol Bartz, former CEO of Autodesk and Yahoo; Aileen Lee, founder of Cowboy Ventures; and moderator Nita Singh Kaushal, founder of Miss CEO. They shared some of their challenges and advice for students. The Tech Museum of Innovation launched the Girls @ The Tech initiative in 2015 to build a pipeline of opportunities for girls that nurture their interest, boost their skills and solidify their confidence in STEM. The initiative supports a series of Girls Days @ The Tech events that engage girls and their families in STEM activities; girls’ participation in the annual youth engineering program The Tech Challenge, which has a high percentage of female participants; and professional development for educators focused on inclusion and engineering design. The event also featured remarks from Rita Holiday, community engagement manager at Intel; Mauria Finley, CEO of Allume and member of The Tech’s board of directors; Marisol Barahona of Catholic Charities of Santa Clara County; and Anna Schlegel, senior director of globalization programs and information strategy at NetApp. Many students at the luncheon said they had their sights set on careers in STEM. Girls @ The Tech is made possible by the generous support of Gilead, Intel, Milligan Family Foundation, NetApp, eBay, Gregory P. Luth & Associates, Inc., KLA-Tencor Foundation, Schwegman Lundberg & Woessner, BNY Mellon, Arm, Bank of America, EY, First Tech Federal Credit Union, Hitachi Vantara, Mike Jacobson and Trine Sorensen, Mayfield, PayPal, SAP, Seagate, Peter and Renuka Relan, Mauria Finley and Greg Yap, Tim Haley and Ethna McGourty in appreciation of Charmaine & Dan Warmenhoven, Cooley, IBM, PwC and Zoom. Additional support provided by Jami and Stephen Nachtsheim, Wayne and Janie Lambert, John and Barbara Glynn, Mona Sabet, Wilson Sonsini Goodrich & Rosati, Rhonda Mahendroos and Dr. Myriam Curet. 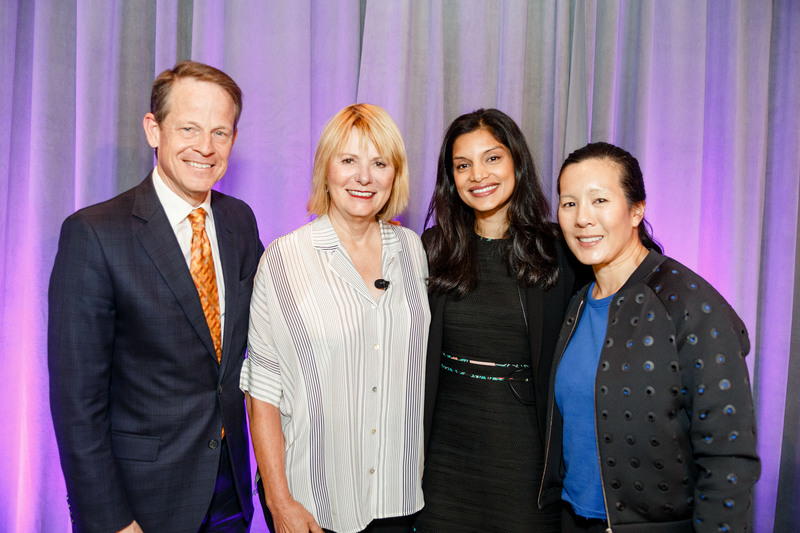 Tim Ritchie, President and CEO of The Tech Museum of Innovation, Carol Bartz, former CEO of Autodesk and Yahoo, Nita Singh Kaushal, founder of Miss CEO, and Aileen Lee, founder of Cowboy Ventures gather at the Girls @ The Tech Luncheon May 16, 2018. The event hosted an important conversation about opportunities for girls in STEM and supporting leadership for women in Silicon Valley. The luncheon is part of the Girls @ The Tech Initiative by The Tech Museum of Innovation.